FAA’s ATADS data shows Peak Year was 1998. Total airport operations in 2014 were DOWN 29% from the peak year. One of the oldest commercial airports in the U.S., General Edward Lawrence Logan International Airport opened in 1923. Years of landfill into Boston Harbor have increased the airport size to nearly 2,400 acres. KBOS is the busiest airport in New England and has heavy traffic to London on four different airlines. The dominant airlines are JetBlue, Delta and American. ATC services are provided 24/7 by FAA personnel. 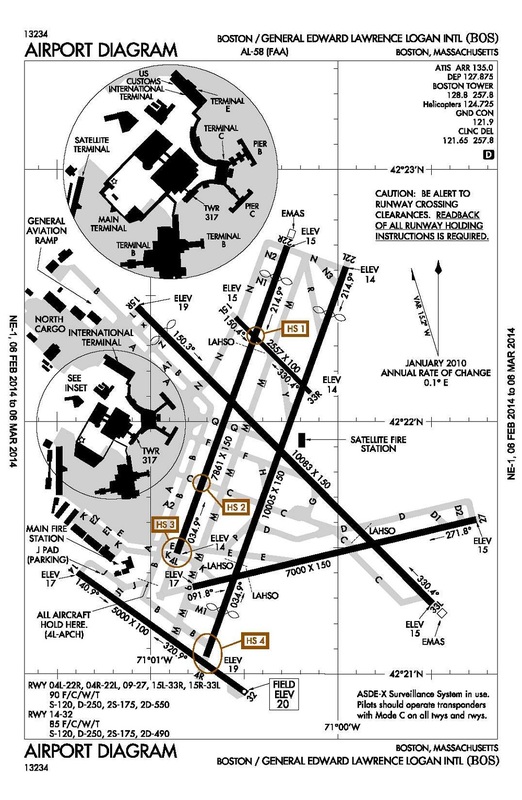 FAA ATADS data show the airport averages 1,009 operations per day (thus, 21 takeoffs/ATC-hr, or 3-minutes between each takeoff, on average). There are no aircraft based at the airport. The airport has an unusual ‘unidirectional’ runway. Runway 14/32 was opened in 2006 and is 5,000′ long, on the south part of the airport property. Takeoffs are limited to RY14 (to the southeast), while arrivals all land on RY32 (to the northwest). This configuration is related to the fact that KBOS has a long history of noise impact upon concerned citizens.